Knowing the vehicle blind spots around your vehicle can save lives. A study put out in Nov 2008 by NHTSA estimates that more than 2 children a week, age 10 and younger, die in backover crashes, and most occur in driveways. The reason for these types of collisions is simply that people, usually the parents, don't see the children behind the car. New drivers are normally more aware of the blind spot to the side of their vehicle when doing lane changes, than how large the blind spot is to the back of their vehicle. Before looking at the two bottom pictures below, first just look at these top pictures. How many kids do you see out the rear window in each picture? You may or may not have seen the heads of the two small boys in the left top picture, but notice there was a small girl whos head was not seen in the picture. They were within 5 to 10 feet of the vehicle. Notice in the right top picture the sticker in the window conceals the boys head to where it's hard to see him. In these pictures the kids are standing to where I can just see their feet on the ground. Notice how far back they must be to see them from head to toe! The vehicle blind spot is about 45 feet back to where you can completely see the ground out the back window of the van the echo is a little less. It's about 2 1/2 lengths of a vehicle you can't see behind on the ground. This means for buses it would be two bus lengths they can't see ground (provided they can see out the back window)! Compare these pictures of the distance you can see the feet of people in front of the car, to the pictures above seeing the feet in the back of the car. It is roughly a distance of 13 1/2 feet in front of this Toyota Corolla to see the boy and his mom head to toe, as opposed to 40-45 feet in back of the vehicles above. It is about 42 1/2 feet behind the Corolla to see their feet. The vehicle on the left is the Toyota Echo. The kids are only about 6 feet from the bumper. Did you notice you could see the boys heads, but not the girls head? The Right pictures are a Toyota 4Runner SR5. The boy is roughly 8 1/2 feet back to barely see his head! If these kids were much closer to the vehicles you wouldn't see them from the drivers seat at all! 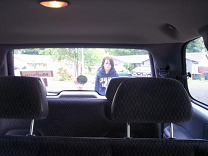 Vehicle blind spots to the side of a vehicle are toward the back corner of a it. This is where an object (car, bike or person) is not visible in your side mirror or directly out your side window. If your Side mirrors are adjusted correctly, seeing most of the adjacent lane, once the vehicle disappears in your rear view mirror, it should become visible in your side mirror. Inspite of this, you could still miss something coming past you near the back of your vehicle for several reasons. 1. The object might be smaller thus harder to see, such as a person, bike or motorcycle. 2.Vehicles could be turning into your lane from side streets or driveways. 4. Curves and hills can hide drivers coming fast behind you. In the top pictures below I am standing where the driver can NOT see me. In the bottom pictures I am standing where I just become visible in the side mirror to the driver. On the left side I must be no further than 4 feet away from the vehicle to be seen. On the right I must be no further than 3 feet away from the vehicle to be seen. 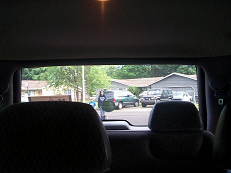 The right side has larger vehicle blind spots because it's further away from the driver, unless you live where you sit on the right side of your vehicle to drive. Below shows how far I must walk back before I am seen again in the side mirror. It is about 30 feet back on either side of the vehicle. More to come on Vehicle blind spots.